The Ringed City is said to be located at world's end. Despite the First Flame fading, there is still a sun in the sky. A tall tower hides a key component of the Ringed City, which also leads to the place where the city's rulers, the Pygmy Lords, live: a barren wasteland of unknown nature. Isolated at the end of the world, the city lays desolate, its ruins half covered in foliage. 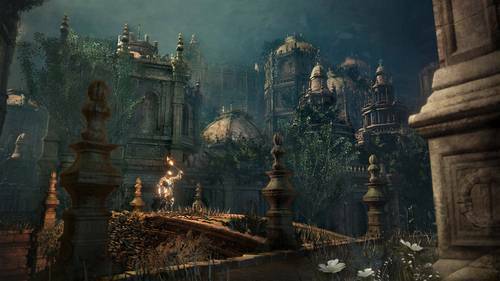 This is the traditional city of the Pygmies, gifted to them by the Great Lord Gwyn. He also sent his youngest daughter here, promising to return for her eventually. Notable locations within the city include: Mausoleum Lookout, Ringed Inner Wall, Ringed City Streets, Shared Grave, Church of Filianore, and Filianore's Rest. The Iron Dragonslayer's Armor Set says, "The Armour, defeated by the Champion of Ash in Lothric, was left ages to rust, until it slipped into an abyssal swamp, where it was possessed once again by the memory of the hunt." The small banner used by envoys of Great Lord Gwyn in the days of yore. Face the ringed cliff and hold the banner high to summon facilitators of transport. For the pygmies, who took the dark soul, the Great Lord gifted the Ringed City, an isolated place at world's end, and his beloved youngest daughter, promising her that he would come for her when the day came.